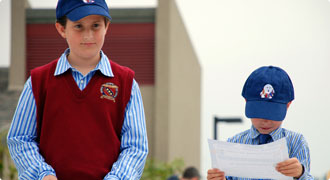 For registration information, download the Summer Campz Catalog (pdf) and Registration Form (pdf). See Programs and Pricing for International Students or Non-Residents of San Diego County. Summer fun for children entering Kindergarten or 1st grade in fall 2019. Students enjoy a wide array of academic, artistic, and outdoor enrichment activities every week, including on-site water slides and water play on Splash Day. Each week includes an “on-site field trip” that accentuates the weekly theme. The Ocean is the Earth’s largest biome, filled with fathomless opportunities to explore its beauty, power, and creatures. 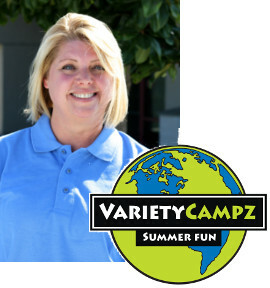 Each day of weeks 1 & 2, campers will be immersed in sea-related activities and projects during their trips to the Variety Campz Theme Room, Learning Center, and Art Studio where they will be inspired by stories, and engaged in play and creative expression. Our blue planet is teeming with creatures that can be beautiful, ugly, or sometimes just plain other worldly. Weeks 3 & 4 will be a fun filled exploration of all sorts of animals through science, art, games, music, stories, and role playing. And yes there will be some creatures visiting! Summer discovery awaits students entering 2nd or 3rd grade in the fall. Students enjoy two field trips each week that take campers off campus (one for learning and one just for fun). The weekly schedule also includes a special, on-site presentation that will keep campers busy and engaged with awesome, theme-related experiments and activities. There will be plenty of time in the Art, S.T.E.M., and Computer Labs, and every Friday campers indulge in water adventures, either at a local beach or on our 27″ high giant “Hurricane” water slide. During “Super STEAM” Week, campers will explore engineering, simple circuitry, and a variety of science crafts in our Computer Lab, and STEM Lab / Makers Space. Field trips under consideration include the Ruben H. Fleet Science Center, The New Children’s Museum in San Diego and The Wave Water Park. “Wet ‘n Wild” Week will be filled with water sports adventures and marine biology exploration. We’ll also splash around with water safety skills and delve into the ocean ecosystem from the puny plankton to tiny sea star to humongous blue whale. Likely field trips include the beach, Alga Norte Swim Center, Stephen Birch Aquarium, and SeaWorld. During “Fantastic & Fictional Character” Week, campers will enjoy the swashbuckling, wizardry and heroics of some of the most beloved literary characters that have been immortalized in print and on screen. Field trips contemplated include Glow Zone, Butterfly Sanctuary, and the San Diego Maritime Museum. “Clever Carnivores” Week will get campers up close and personal with ferocious felines, boisterous bears, cagy canines, dinosaurs, and other fearsome meat-eaters that sport night vision, sharp teeth, powerful jaws, amazing leaping abilities, and stealthy stalking behaviors. Field trips are planned to the Safari Park and The Wave Water Park. Let’s face it, what’s the point of summer anyways? School’s out, and kids want to have the time of their lives, right? 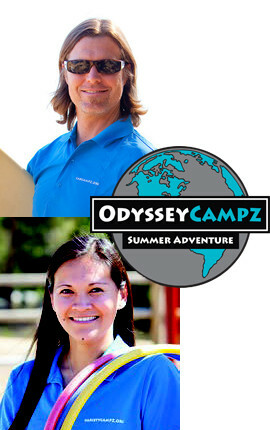 Odyssey Campz has discovered a winning formula that will take campers to a new level of fun and engagement this summer! Yes, we’ve decided to continue letting campers choose their own adventures each week during Odyssey Campz! Why? Because over the years we’ve learned that participation in the planning process gets everyone engaged in the action. Each week of Odyssey Campz includes both Aquatic and Land-Based Adventures. This means that students will be able to choose whether we go to the beach, go paddle boarding, snorkeling, kayaking, tide-pooling, or even visit places like Sea World, The Stephen Birch Aquarium, or the Dana Point Ocean Institute, as well as visit Solid Rock Gym for a day of rock climbing, or Get Air, zip lining, orienteering, wildlife tracking, skateboarding, or even a trip to a favorite theme park! Odyssey Campz Adventures Are Unique & FUN! While we’re adventuring in and around San Diego County, or maybe beyond, we’ll also be infusing leadership, team building, and confidence boosting skills that campers will take with them for the rest of their lives. We’ll also be targeting learning and S.T.E.A.M. * components, honing outdoor and survival skills, and keeping bodies and brains engaged all summer long! There is not another camp out there that is willing or able to go above and beyond to give campers the summer of their dreams…so, make this summer an Odyssey Campz summer! 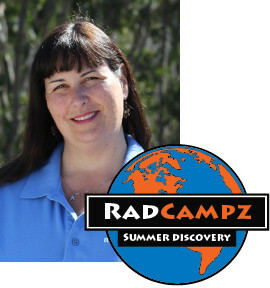 You may download the required form here*: Summer Campz Registration Form (pdf). If you would like to enroll, please print the forms (print double sided if possible) and either mail or bring it to the following address. 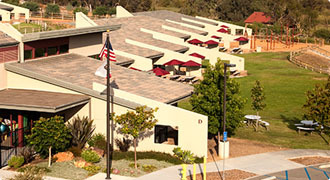 Include a check addressed to ECDS (Encinitas Country Day School). Register now and take advantage of early enrollment pricing! 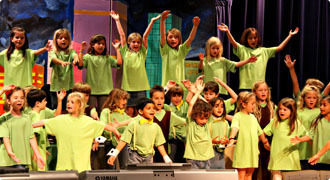 Full information on our summer programs can be found in our Summer Campz Catalog (pdf). *See Programs and Pricing for International Students or Non-Residents of San Diego County.